PRO FRAMEWORK is probably my greatest achievement. This indicators has been designed to assist trader in a semi-automated manner regarding price filtering. This is an absolutely essential step into any speculative strategy, and most of the time, the most poorly achieved by begginers in trading. Professional traders may already have their own way to do this task but will easily get familiar with the automated tools provided with Framework to complement or even replace their current tools. For apprentices, this tool will help them avoiding subjective price analysis (guessing or even worse than that… gut trading). This tool is designed to emulate a price framework to work within. The most commonly used and most effective way to do this is to frame the prices into dynamic channels. There are many existing solutions for this but mine is absolutely exclusive and has been defined to suit very agressive trader’s needs (and therefore will also please the least agressive ones). The goal was to find a sweet spot between a surgical tool with very advanced capabilities, but still having a clean render on chart. 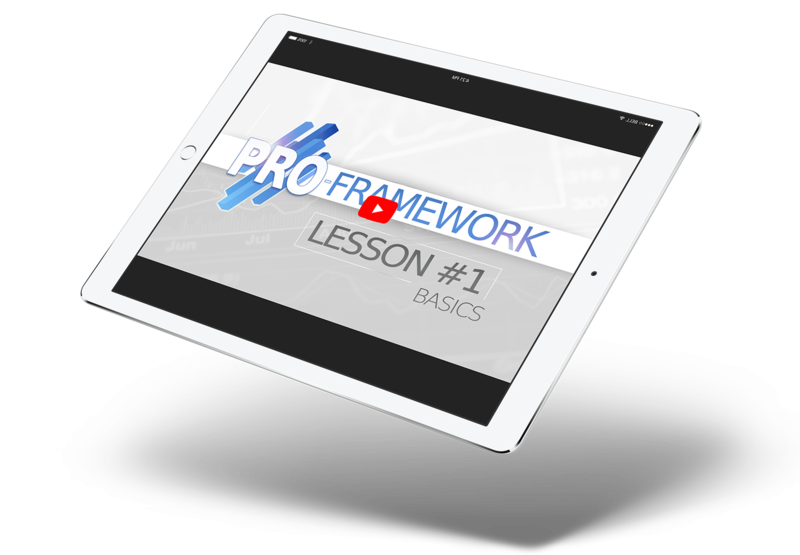 What’s added to make it Pro Framework ? The original formula has been optimized for faster response. A very complex algo will link the Sinewave oscillator to the prices. A final algorithm will detect price reversal to confirm the cycles. The indicator will allow to trigger alerts on any of these signals. All the plotted signals are performed in realtime and has no repainting. 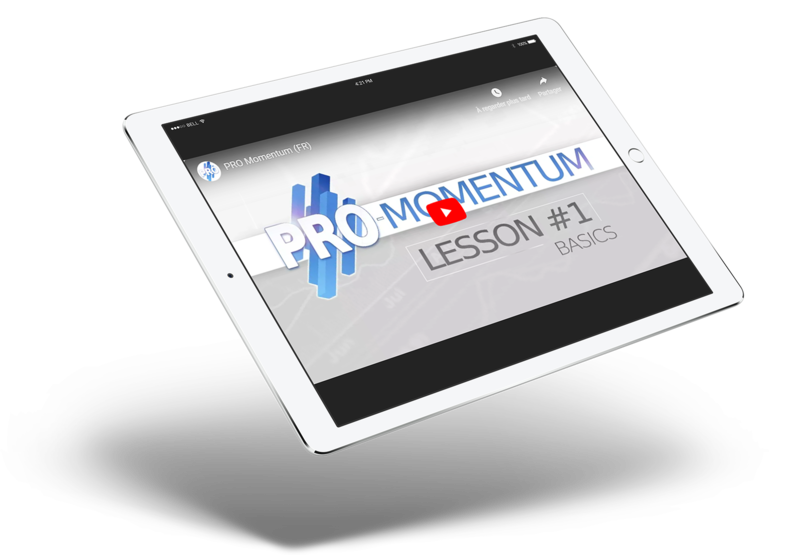 PRO MOMENTUM is almost certainly the most advanced momentum indicator you’ll come across. The formula itself is exclusive and is like a perfect mix between RSI and MACD. But the real value is added by a very complex detection algorithm that will trigger signals you can rely on to trade with high risk management. The indicator will scroll through hundreds of patterns that I have learned all along my years of trading. It’s like having a professional always looking over your shoulder and telling you when you’re good to go or not. Momentum based indicators are simply the expression of price movements compared to their previous levels bars ago. The more the price will move fast to the upside the higher the momentum value will be. What’s added to make it Pro Momentum ? The momentum formula is totally exclusive and I created it. Then a built-in 150+ pattern algo is scanning conditions that may be of interest to trade. You’ll be signaled if the momentum shows trends reactivations, taking profits or exit patterns. Here at PRO Indicators, , the goal is not to sell you some stuff and leave you alone out there. You’ll have unlimited acces to free educationnal content with daily video updates and a full support to help you getting the best of your indicators and the overall PRO Strategy. The support is provided through a Discord channel where users will support eachother, sharing tips and signals, making the entire community getting better day after day. Experienced users will teach the newest ones and i’ll also be there in person to answer any questions you might have. Providing the best possible support is the most important to me. Daily video updates forecasting the markets using the indicators in a realtime market context. Hundreds of users gathered in a Discord channel to provide help and support. Experienced users sharing tips & tricks to the newest ones, getting the whole community better and better. A +20 pages PDF manual provided to understand what’s happening in the background of your indicators. Some indicators you may come across are using the repainting mode (which consists in correcting false signal back in time). You’ll never see such thing here in Pro Indicators. What’s on the charts is displayed in real time, no cheating ! Trading View will automatically push the updates to your charts. As these indicators are always improved on a day by day basis, they are updated regularly. But you’ll never have to worry about that ! Here at Pro Indicators, the goal is not to sell you stuff and leave you alone out there. You’ll be guided to learn safely how to read the indicators signals, and improving your risk management. You’ll be provided with daily educational content and support.